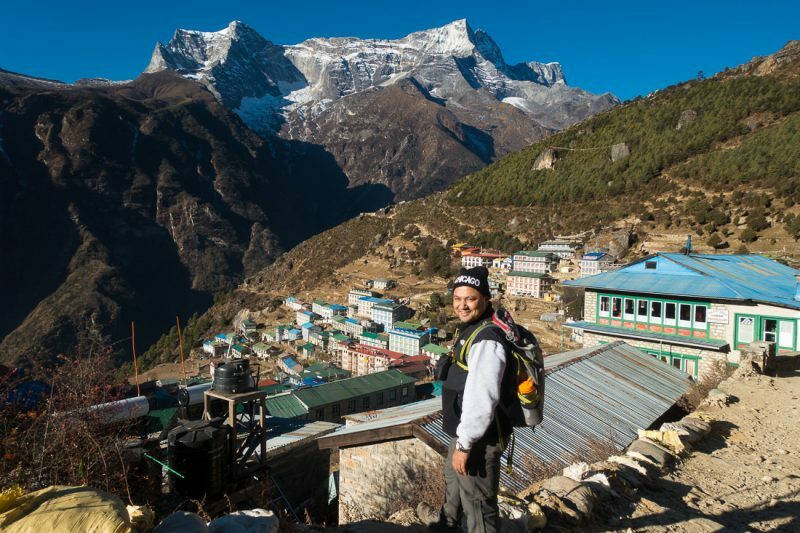 Almost one year after the earthquake that rocked Nepal, Nepalis were back on their feet rebuilding homes and livelihoods, with tourism back in business. 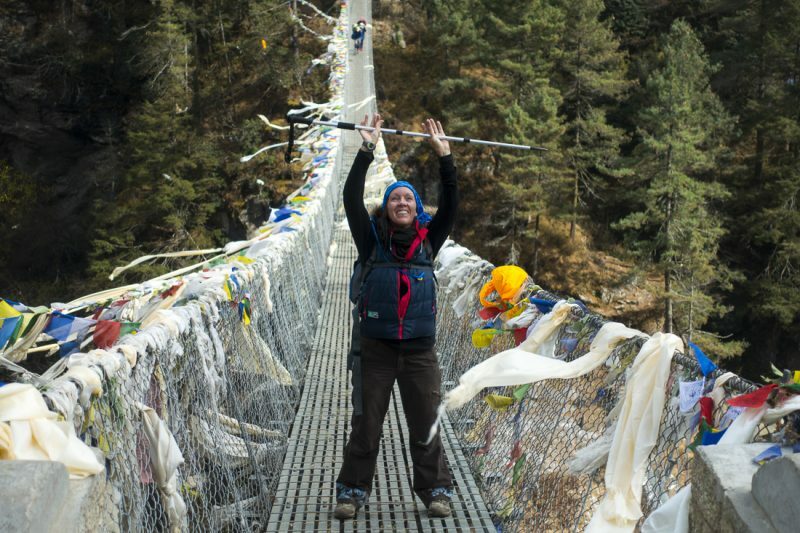 Fiona Harper hiked to Everest Base Camp and is struck by the strong spirit of Nepalese people. ‘I was in the lobby of a hotel when there was a loud roar, the floor started rocking and a large vase crashed to the floor. I ran outside and kept on running but it was hard as the road was rippling like a wave’, recalls Ganga Thapa, his eyes sad as he relived the terror of the 7.8 magnitude earthquake that struck Nepal on 25 April 2015. Mid way through our Everest Base Camp hike, respected leading tour guide and co-founder of Nepal Hiking Team, Ganga talks softly about the day when Kathmandu moved three metres southwards. As I look over Ganga’s shoulder the snow-clad summit of Mt Everest pokes above Mt Nuptse. Against a cobalt blue sky, a cloud of powdery snow forms wispy tendrils blowing off the upper peak. Having seen so many photographs of this famed mountain over the years, tears well in my eyes the first time I catch sight of it. Known as Sagamatha by Nepalese and Chomolungma by Tibetans, nothing prepares me for seeing it in the flesh. It is majestic. The craggy twin peaks of Alma Dablam, which Ganga affectionately calls the ‘beautiful mountain’ dominates the foreground. At 3,440m above sea level, the air is crisp and clear. Though it’s a few weeks into winter the sun on my face is as warm as toast. Multi-coloured Buddhist pray flags flutter softly. Pausing during our chat to admire the stunning mountain landscape before me, the silence is absolute. Ganga describes the road rising of its own accord beneath his feet making it difficult to run down the road as he searched for a clear space. 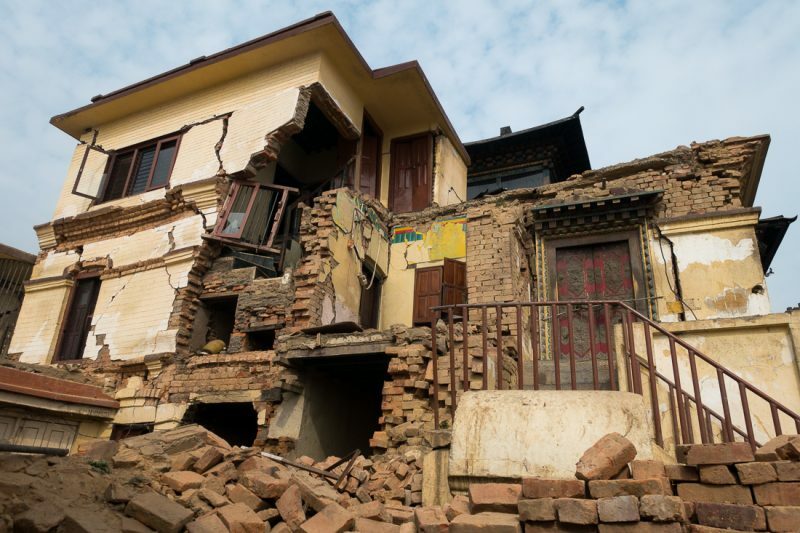 All around him in downtown Kathmandu buildings were cracking and toppling. He estimates the ‘earth was moving’ for about two minutes. Almost 9,000 people died. Millions were left homeless. Historic Durbar Square, where royal palaces have stood since the third century, granted UNESCO World Heritage status in 1979, was in ruins. One year later, when I visit this spiritual heart of the former Kathmandu Kingdom, ancient walls are propped up with timber struts & scaffolding. Many people still live in makeshift shelters battered by monsoon rains, buffeted by winter storms. 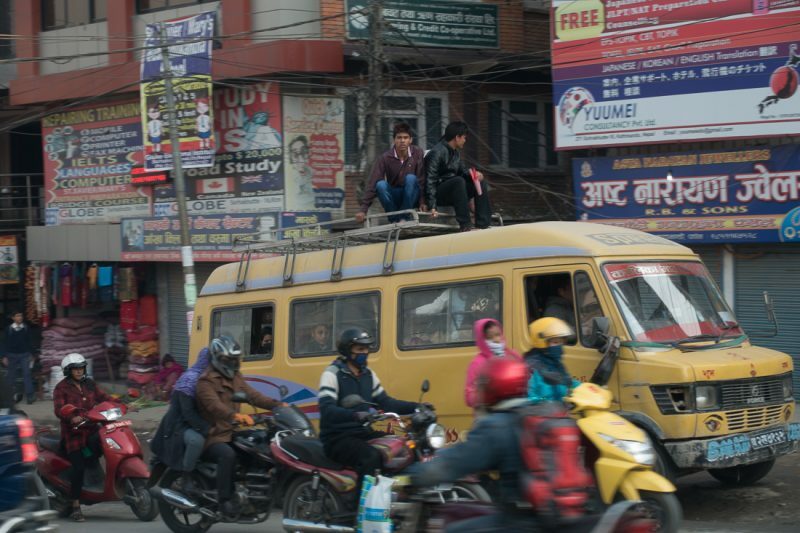 A fuel crisis makes matters worse with Indian border blockages preventing fuel deliveries into landlocked Nepal. Blackmarket prices for fuel have skyrocketed. One woman I spoke to said she had been trying for one week to purchase a LPG bottle so that she could cook meals for her family. Everywhere there are lines of vehicles at petrol stations that stretch for kilometres. Resigned Nepalese shrug their shoulders and ask what else can we do? Walking down a lane on the way to dinner in Kathmandu the bitumen ends abruptly in a cavernous hole. I peer down and see footings of a building that once stood here. A new path has been forged over rubble. I readjust my stride as I step over all that remains of the hotel, unable to imagine the terror that must have ensued as it came down. But the Nepalese are resilient, finding plenty to be grateful for. Ganga says he is thankful that the earthquake struck on a Saturday, the only day that children don’t attend school. With approximately 7,000 schools destroyed or significantly damaged, he says many more lives would have been lost. 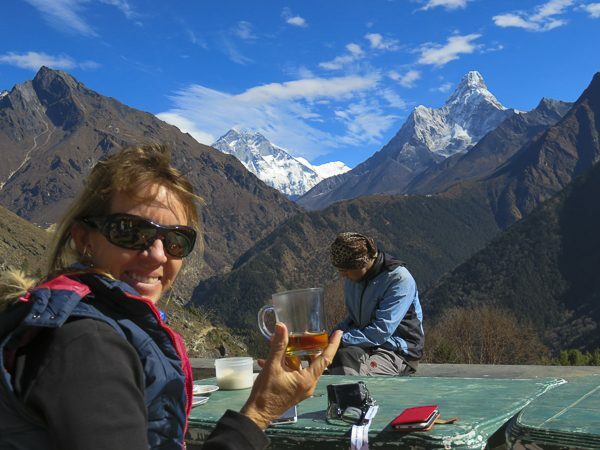 We’re sitting outside a teahouse bathed in winter sun at the top of the ridge overlooking the village of Namche Bazaar. 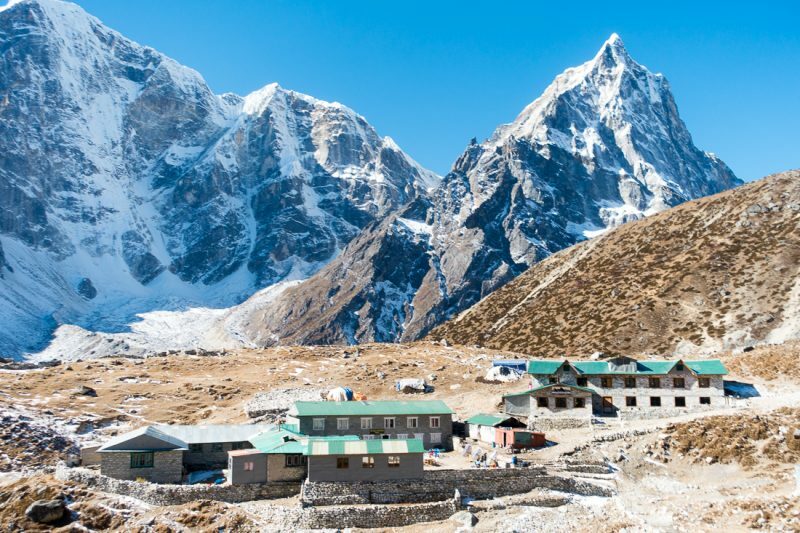 Nearby, a bronze statue of Tenzing Norgay Sherpa, his ice pick raised skyward, commemorates legendary Sherpa who grew up in the Khumbu Valley and went on to summit Everest on his seventh attempt. He is especially revered in these parts. In his autobiography Norgay says that people think he must have three lungs because he has so little trouble at great heights. ‘I think that I was born not only in, but for, the mountains. I climb with rhythm. it is a natural thing for me. The high places are my home. They are where I belong,’ he says. 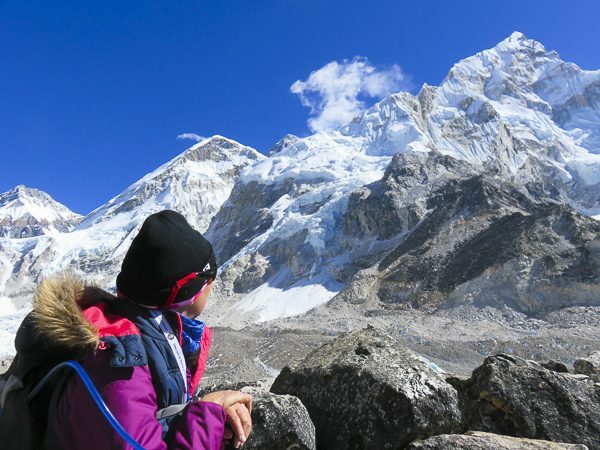 We’re three days into a 12 day hike to Everest Base Camp, taking the opportunity for an acclimatisation day to absorb the mountains bathed in winter sun. Nepal sits at the juncture of two volatile tectonic plates. The process of releasing pressure was responsible for creating the Himalayan Mountains a gazillion years ago. 45 homes in Ganga’s village, including his own and that of his brother Balaram, were totally destroyed on that April day. His neighbour, the mother of his childhood friend, perished in the quake. The entrepreneurial brothers, who set up Nepal Hiking team back in 2007, were instrumental in getting the village back on its feet. They quickly sourced supplies of rice and lentils for distribution amongst villagers who hadn’t eaten in the days following the quake. 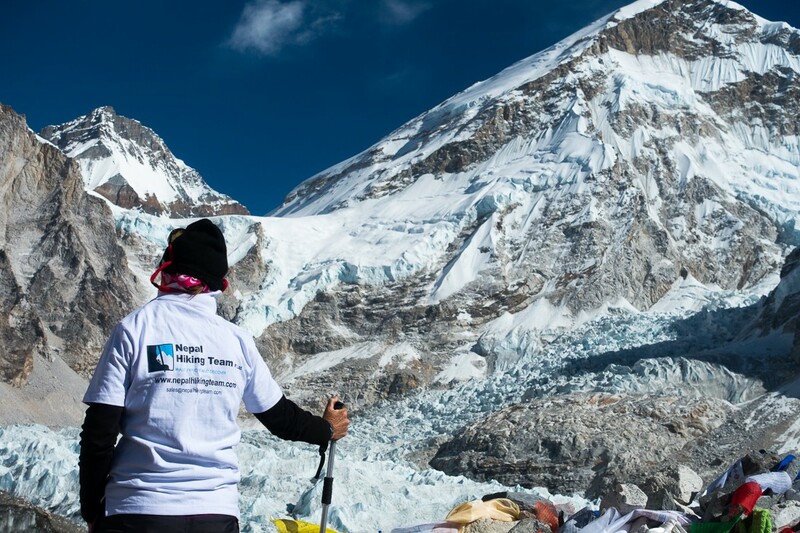 With their trekking business temporarily shut down as tourists cancelled bookings, they returned to their home village to help rebuild homes, roads and basic infrastructure. ‘When our relatives are in trouble we must help,’ Ganga said. Despite their own heavy financial losses they helped to build 45 new homes which have become semi-permanent dwellings for villagers one year on from the disaster. As we progress towards Everest Base Camp we occasionally see the remnants of collapsed homes. At these high elevations buildings are traditionally constructed from rocks secured with a mortar of mud and yak poo. External walls are rendered in the same mix hardened by the sun. Villagers wealthy enough to afford modern materials are building replacement homes out of plywood and colourbond sheets. With no roads, men and mules physically carry all materials up the steep mountains. Porters are paid by the weight they can carry – the more the weight, the more they earn. I pass a 16 year old boy resting on the trail who tells me the load of colourbond sheets on his back weighs 91kg. He will earn the equivalent of 57USD. He says he is happy to have the work. Nimble-footed and lean, he will return down the mountain to pick up similar loads for as long as there is a need for raw materials higher up the mountain. His fortitude makes me feel rather pathetic as I gasp to catch my breath in the thin mountain air. Tenzing Norgay Sherpa says that when he was similarly aged as I am, the word Chomolungma meant ‘the mountain so high no bird can fly over it’. The same could be said for the soaring Nepalese spirit. 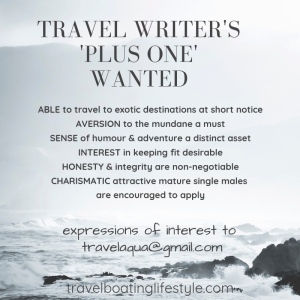 This story first appeared in Silk Winds, the inflight magazine of Silk Air. Mountains!!!!!!!!!!!!!!!!!!!!!!!!!!!!!! thanks for sharing this amazing post especially for the pics. Thanks for post. Everything is back in normal after mega quack! Nepal!